Before i try to fly is there any settings in betaflight or on my transmitter (Spektrum dx6e) that would make learning to fly eaiser? Do not bother with angle mod use horizon instead. These settings make it fight you less but still auto levels. If you feel you must use angle or want to try indoor flight set. Last set min throttle to 1050 - 1070 to better catch the quad after flips and rolls as well as better control when in ground effect under 6 inces off the ground. thanks for the reply Im just not sure what Im supposed to do with this info. Im very new to all this. Put those numbers into beta flight in ther listed places. They will make the gremlin lesd twitchy and more easy to fly. The rates tell the flight contoller how fast to change and the super rates make the centers more soft changes and the further away you go the faster it will move. The others are to make assisted modes fight you less so it does not lyrch in and out of autolevel so violently. Ok only thing I cant find is the sensitivity. Where is that option in betaflight? Any expo or dual rates you would recommend? Sensitivity is in the same box as the other horizon and angle settings. Quads do not use dual rates. Thats all done thru rate and super rate settings. With 4 motors doing all the changes it does not require a high / low configuration. The way I mixed rate and super rate it has built in "expo". Adding expo to that would make it very unpredictible in bigger stick movements. Tons of things you can change but nothing will make it easier. rates and super rates and expo will make it fly better but only mess with if you feel you know what the setting does and only change one thing and test. Some of the local folks start out in with "acro trainer" mode. It allows acro but with limits and the quad wont flip or roll but will allow acro mode. You can throw 20% expo on pitch and roll in the radio but honestly....if you can get it hovering (above ground effect (about a foot in the air)) without oscillating i wouldn't mess with anything. If you are talking about FPV, a lower camera angle will make things easier. 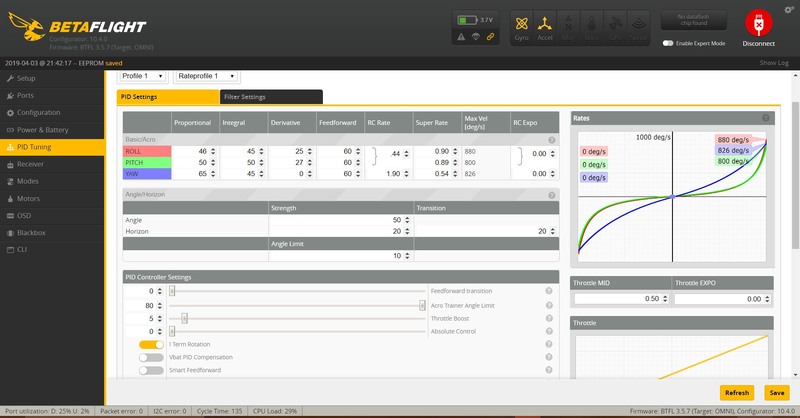 Im not seeing it I screen shot betaflight. Looks like a change since I last updated. I do see a scroll bar on the side. See if scrolling down revels it. It may have been removed since I last updated. Its not real important. You should be flying acro from the start. Its ok to use assisted modes tho. I set my mode switch up on a 3 position. Position 1 is horizon mode. Pos 2 is acro with no air mode (used for landing so air mode doesnt bounce it around). Pos 3 is acro with air mode. (Main mode to be flying in). If you need I can grab a few screen shots to show how that is done. have you used acro train mode? No I learned to fly long before that was a thing. Its simple and fast to learn if you have a process and learn basics first. Using those tamed down rate settings will give you a much easier start. If you want specifics on how to build up quiker let me know Ill write up a plan and pm you. @dshaw I am learning to fly quads FPV and LOS at the moment. I found acro trainer pretty hard LOS, it’s easy to lose orientation especially when rolling sideways. Basically the difference between Acro Trainer and auto level is that acro trainer requires you to make a counter move with the sticks to change the control input, it doesn’t level as soon as you let go or centre the sticks. It still has an inclination limit, you can change the angle in Betaflight, so that can help. I have a mode switch set up with Level, Horizon and Acro Trainer on my TX to switch modes, I have been flying my FPV learning flights in Horizon mode, which allows greater angles of movement that auto level. Next month once I have more hours on I will switch to acro trainer. Setting up rates made a big difference, I have just copied Bardwell’s racing low rates and freestyle rates, again put on a switch. Psyborgs rate settings for the Gremlin are bound to be good! Having a smooth, less twitchy set up will help a lot with first flights. Flew a couple times over the weekend. I tired the acro Trainer. Not sure if I like it. I seem to over correct and freak out and kill the throttle. I can't find the Level mode You were talking about. Also what does it do? Sorry, it’s called Angle mode on Betaflight, it’s the full gyro assisted mode, where the minute you let go of the right stick or centre the yaw it levels off. It’s OK but you will learn bad habits from flying in it. Sometimes having it as a panic switch is useful when you are learning. I am making a conscious effort to only fly in acro Trainer with Horizon as my “panic switch.” The right rates with acro trainer will help more than heavy reliance on the auto level. I have setup a switch to control modes Angles, horizon, and acro trainer. I have acro trainer set at 10% . I agree that angles kinda dumb's down the experience. But I still seem to lose control when it in acro trainer. I found that I was over rolling on turns, that was my problem, then losing control as the quad went sideways or sideways and down in the roll. I would get disoriented and have to go back into Horizon or level mode, or the ground! I was flying like a plane where you use more aileron on turns. Try taking off in Horizon mode, going to about 30ft then use only yaw and pitch as the primary controls in turns, feed a little roll into the turn like leaning in when you corner on a bike. I found that helped. Figure eights teach a lot. I also fly with artificial horizon on my OSD. Do you know how to adjust the angles mode to make it more responsive?